We’ve curated our top drink picks for July 4th thanks to the help of our blogger friends This Silly Girl’s Kitchen, Shabbyfufu, and Busy Wife Busy Life. Serve these delicious drinks at your summer gatherings and take your entertaining to a whole new level! Our friend at This Silly Girl’s Kitchen has put together a delicious, refreshing and easy to make Strawberry Limoncello Slush made with our Bellini Limoncello and Cruse Demi Sec Sparkling Wine. Find all you need to recreate this recipe at our Sparkling Cocktails and Recipe Page! Blogger Shabbyfufu shows us how to make a fresh and delightful Limoncello Watermelon Spritzer. With this recipe, your party is sure to be the hit of the summer and have your guests coming back for more! Busy Wife Busy Life walks us through a simple, but cool and delicious, cocktail to serve at your summer gatherings. Because let’s face it, entertaining during the summer is meant to be easy and stress free. This light and refreshing Sparkling Rosé Punch recipe can be found here. Shabbyfufu introduces us to her moscow mule which is a staple for summer refreshments. Served in a chilled copper moscow mule mug, this beverage will keep you cool and refreshed while entertaining outside during the warm weather. To discover more delicious drink ideas head to our Cocktail Corner ! OK, this week of puns has pretty much jumped the shark … but we still have a few more Sharktails to share. They haven’t lost their bite just yet! Enjoy these killer shark-themed cocktail ideas as you channel-surf TV this weekend. And don’t think our Sharktails are dead in the water just because the week’s almost over. Saturday, as all the sailors and fishermen know, is National Rum Day, so we’re floating a few ideas for tasty rum drink recipes as well as tequila drink recipes. We’re in the tank for all of these Sharktails. Cheers! Looking for more rum drink recipes? Let us reel you in to our cocktail corner for some tasty suggestions. If this Sharktail doesn’t quench your thirst, more cocktail recipes are lurking just under the surface! Natalie Migliarini is a mixologist, cocktail stylist, photographer, and recipe developer in Seattle, Washington. Her passion is discovering new and creative ways to use booze through fabulous cocktails featuring seasonal ingredients. Check out her other delicious creations on her blog Beautiful Booze. We have so many shark-themed cocktail recipes flying around, it’s like a drinknado in here! As shark season continues, test the waters with some more killer cocktail recipes for your TV-viewing parties. Try an Irish cream recipe and our rum cocktail recipe — hey, you’re barely taking a bite out of all the possibilities. And what goes well with Sharktails? Oh, you know, just some nibbles. Pour Mr. Stacks Blue Curacao into shot glasses. Layer the Fennellys Irish Cream on top of the blue curacao. Then drip the grenadine into the shot glasses. Serve immediately. Yield: 2 servings. Fill blender with Doorly’s Macaw White Rum, coconut water, strawberries, Aperol, banana, and ice. Blend until smooth and pour into serving glass. Top with grenadine. Garnish with coconut-water ice cubes made in shark fin molds and strawberries skewered on a paper straw. Yield: 1 serving. Looking for more rum drink recipes? Check out our cocktail corner for some tasty suggestions. Don’t let shark season sneak up on you! Gather your chums together, get some fin-spiration with these killer sharktails and transform your TV-viewing party into a Jaws-dropping good time. It’ll be a real frenzy! We think you’ll agree each drink is so good … you’re gonna need a bigger glass. Add G&J Greenall’s Gin, lemon juice and ice to a cocktail shaker. Shake, then strain mixture into serving glasses. Top with blue soda and drop a cherry into each glass. Garnish with gummy sharks on skewers. Yield: 2 servings. 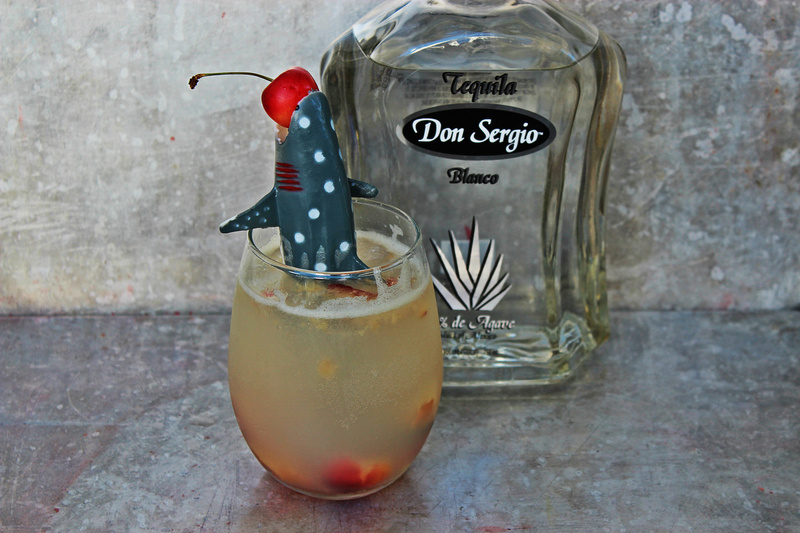 If this Sharktail doesn’t quench your thirst, more gin drink recipes await your exploration! In a cocktail shaker combine vodka, ice, sliced jalapeños, vermouth and grenadine. Shake mixture for 20 seconds, then strain into a shark glass. Garnish with jalapeño. Yield: 1 serving. Take a deeper dive into our cocktail corner for even more vodka drink recipes. Add sparkling white grape juice to a medium saucepan. Turn heat on low and slowly sprinkle 10 envelopes of gelatin into saucepan with liquid. Stir until the gelatin is dissolved. Remove from heat and stir in Largo Bay Silver Rum and Mr. Stacks Blue Curacao. Pour mixture into a glass container. Put in refrigerator to chill for 2 hours, then place all “underwater” garnishes in the gelatin mix. Return container to the refrigerator to set (we left ours to chill overnight). Take container out of the refrigerator and rest the “beach” garnishes on top of the gelatin. Use a spoon to dip out gelatin into individual servings in glass cups or bowls, making sure each serving gets a special sea treat! Need more fin-spiration? We have a full tank of additional rum drink recipes in our cocktail corner!